Here at SolarQuotes we’re all about consumers. 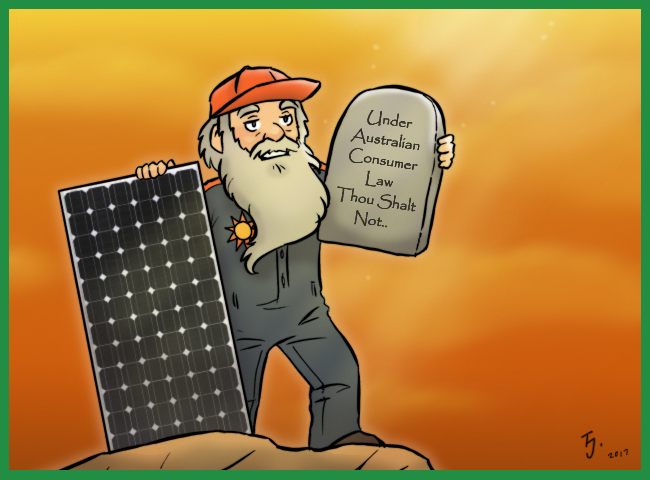 So I am going to describe 10 features of Australian consumer law that many consumers, not to mention many solar sales companies, installers and hardware manufacturers, are unaware of. While I am no lawyer, I have read some very thick pamphlets on consumer law and I think I have the general gist of it. There’s no need to worry about my level of comprehension as I am very literate. I can read with one arm tied behind my back. Goods must be of acceptable quality. This includes being reasonably durable. Goods must match provided descriptions. So no lying about products. Express warranties must be honored. These include written and verbal warranties. Goods must be fit for any disclosed purpose. This means a product has to be able to meet requirements stated by a customer. Both manufacturers and suppliers are responsible for the first three. The supplier in this case will be the company that sells the solar to the consumer. To keep things simple I’ll call this entity the ‘installer’1. The manufacturer will often be the companies that make the solar panels, inverters, and other hardware used by the installer. But if a manufacturer does not have an office in Australia then the importer of the products will be responsible. The final consumer guarantee — goods must be fit for any disclosed purpose — is provided by the installer. If products do not meet consumer guarantees, then the customer is entitled to a remedy. This could be a repair, a replacement, or a refund. Consumer guarantees apply to almost everything households buy. Consumer guarantees can apply for business purchases too. Installers and manufacturers cannot wiggle out of consumer guarantees. Express warranties are what manufacturers and installers write, say, or clearly imply. No matter what a written warranty says it cannot affect consumer guarantees. Consumers may be able to receive a repair, replacement, or refund after written and verbal warranties have expired. If a product wasn’t misused consumer guarantees apply. Installers cannot charge customers labour to remove or transport faulty solar panels or inverters. Installers cannot fob customers off onto manufacturers. Consumers can be compensated for consequential loses. Do you own a business? If you don’t you really should give it a try. It’s a great way to cheat on taxes — I mean minimize taxes, in a perfectly legal way. But if you are not a business owner then almost every thing you buy will be covered by consumer guarantees. They cost $40,000 or less. So your Game of Thrones Blu-ray box set is covered. (Even the $35,000 platinum version that includes Peter Dinklage). They cost more than $40,000 but are normally used for personal, domestic, or household purposes. So your $100,000 Tesla sports car is covered. It’s a vehicle or trailer mainly used to transport goods on a public roads. So if you have a huge rig with a big donk, it’s covered. Rooftop solar systems and home batteries are definitely covered by consumer guarantees. Even if you managed to spend over $40,000 as long as it’s for your home, it’s covered. It was for the purpose of resupply. So those Terminator dolls you bought to restock your shelves down at the Nerd Hut aren’t covered. They are used or transformed through processing, production, or manufacture. So flour bought to bake bread is not covered. They are used to repair or treat other goods or fixtures — on land. So perhaps there are exceptions for ships, planes, blimps, satellites, moon “lasers” and so on. But you’ll have to talk to a lawyer about that. Despite these exceptions there’s still plenty of stuff left that’s covered by consumer law. A baker’s $8,000 industrial bread oven is covered, as is the table she uses to knead dough and the safe she needs to use to stow her dough. What is definitely covered is any solar or battery system that costs $40,000 or less – even if it is used for business. You know those movies in which Arnold Schwarzenegger is actually a robot inside? Like in Terminator, Terminator 2, and any movie where he has to express an emotion other than shouting? You know how he is completely relentless and unstoppable in those movies? Well consumer guarantees are like that. There is nothing sellers and manufacturers can do to stop or destroy them. Businesses cannot tell people consumer guarantees don’t apply and they cannot get customers to agree to give them up. No small print in contracts or warranties can remove them and large print can’t do it either. A supplier can state a product is defective and in what way it is defective and if a customer decides to buy it then the consumer guarantee of acceptable quality won’t apply for that particular defect, but it will still apply for any undisclosed defects that might appear. Under Australian consumer guarantees all express warranties must be honored. These are warranties given by manufacturers or sellers and can be written or verbal. If a manufacturer gives a product a warranty and an installer merely describes that warranty, then they are not responsible for the manufacturer’s warranty, but are responsible for any additional warranties they give. Also, if a manufacturer is unable or refuses to honor their warranty, the installer can be required to provide a remedy, as they were the ones who were paid to provide a solar system and under Australian consumer law that system has to be of acceptable quality. An express warranty can be any statement about a product that a reasonable person could interpret as being a promise about its expected performance or lifespan. So if a salesperson says, “It’s warranty is only for 12 months, but you can expect it to last 5 years,” then the salesperson just gave it a 5 year warranty, as a customer could quite reasonably conclude it will last them 5 years. A common example of businesses unintentionally giving an express warranty is when they state a product has a design life that is longer than its written warranty. If a consumer is told a product has a design life of 20 years then it is quite reasonable for them to conclude it will last 20 years and so that becomes an express warranty. If there is any advertising material stating the product’s design life is longer than its written warranty, you may want to hang onto it. A salesperson might “forget” verbal warranties they gave, but, unless their psychic powers are highly developed, they can’t forget away a sales brochure. Consumer guarantees provide a minimum level of protection. Express warranties are supposed to be additional promises above and beyond that. However, a common tactic by manufacturers is to provide a written warranty with a list of exceptions that make it weaker than consumer guarantees. But no matter what exceptions a written warranty contains or what conditions it states will render it void, it will not effect consumer guarantees. For example, the written warranty of an inverter could state it doesn’t cover failure resulting from grid voltage fluctuations. But the consumer guarantee that requires goods to be of acceptable quality means an inverter must be durable enough to survive grid voltage fluctuations for years. It is reasonable to expect an inverter to be able to survive voltage fluctuations, as they are a normal part of Australian grid supply. If an inverter couldn’t handle them for an extended period of time it would not be of acceptable quality. Another example is a written warranty that exclude faults resulting from short circuits caused by insects. But selling an inverter that cannot resist intrusion or damage by insects in Australia would be like selling an inverter that cannot resist drizzle in England or bad political choices in the United States. It would not meet the acceptable quality requirement. A solar panel warranty may state they need to be cleaned by an accredited solar installer to remain valid. But it is not possible for solar panels to be damaged by not being cleaned that way. Not in this world. And if it was possible, they would be too fragile to be of acceptable quality. A written warranty may also give a list of hoops to be jumped through for it to apply if a fault occurs. But while a customer should clearly state the problem they have with a product and if it shows visible signs of damage and any error codes it may be displaying, that is the limit of what needs to be done for action to be taken under consumer guarantees. 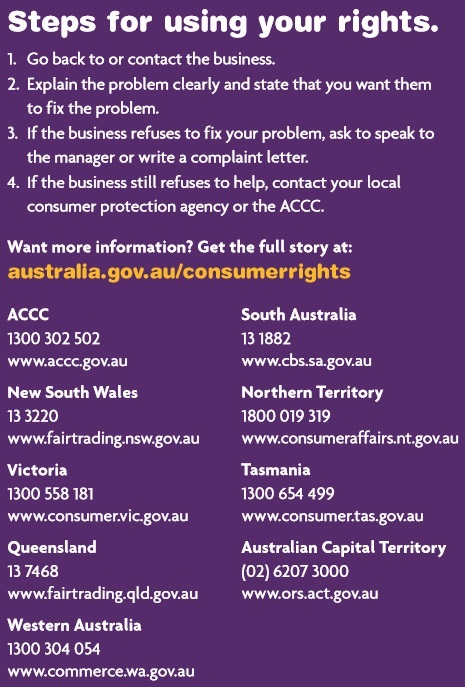 Businesses cannot require consumers to do things such as send photographs, perform tests or diagnostics, call helplines, pay a fee, or buy items or tools before attempting to provide a remedy. That said, if you can perform tests or diagnostics without undue difficulty, it can be worthwhile to do so to hasten the resolution of the problem. But these should be things that take minutes, not hours. According to Australian consumer guarantees goods must be of acceptable quality. This means if a product fails before a reasonable amount of time has passed you are entitled to a repair, replacement, or refund and this is the case even if express warranties have expired. Just what is a reasonable amount of time will depend on the product and how much it cost. For example, if you bought a budget model 5 kilowatt solar inverter for $900 and it broke down one year after its 5 year written warranty was over, then it is likely a consumer tribunal or small claims court would rule it is not reasonable to expect a low cost inverter to last long beyond its 5 year warranty period and so you aren’t entitled to a remedy. But if you paid $2,000 for it and it broke down one year after its 5 year warranty was over, then a consumer tribunal or small claims court could decide your are entitled to a remedy, as a reasonable person probably would not have spent that much on an inverter if they knew it would fail after only 6 years. Consumer guarantees don’t apply if a customer damages a product through misuse or abnormal use. So if someone decides to clean their solar panels by giving them a good hard scrub with steel wool, neither the installer nor the manufacturer are responsible for the resulting decline in performance. It would be the stupid scrubber’s fault. But anything done by the consumer that does not harm the product does not affect their consumer guarantees. So if a homeowner cleans their solar panels themselves but does it sensibly, because that does not harm them, an installer or manufacturer cannot refuse to honor warranties because the cleaning wasn’t done by a professional. The same goes for if someone other than the original installer performs maintenance or repairs upon a system. As an example, the Australian Competition and Consumer Commission (ACCC) has instituted proceedings against Apple in Federal court for refusing to service iPhones repaired by a third party. If the cost of returning faulty goods is significant, then the supplier must collect them at their own expense. This includes the cost of labour for uninstalling panels or inverters. If a supplier needs to pick up these goods at their own expense, then installers will definitely need to collect defective panels and inverters at their own expense, as they require electrical skills, qualifications, tools, and safety gear to uninstall. Both manufacturers and suppliers are responsible for ensuring goods are of acceptable quality. So if solar panels, inverters, or other hardware in a rooftop solar installation fails, installers cannot simply direct people to the manufacturer and wash their hands of them. If you went to Tall & Fat to buy a new suit and the seams came unstitched the next day it wouldn’t be acceptable for the store to refuse to help you and merely refer you to the manufacturer in Poland. That would be completely unacceptable. And solar installation isn’t a privileged business with a special exception that allows it to do this. The purchaser of rooftop solar pays the installer, not the manufacturer, and under Australian consumer law that system has to be of acceptable quality, which includes being reasonably durable. Because of this responsibility, if there is a fault the installer must ensure either the manufacturer honors their warranty or provide a remedy themselves. If a manufacturer is unwilling or unable to provide a solution then the responsibility falls upon the installer. While an installer is not responsible for a manufacturer’s warranties, they still share responsibility for hardware they sell being of acceptable quality. This means if a manufacturer goes bankrupt an installer can become responsible for providing a repair, replacement, or refund for solar hardware they have installed. This makes it important to avoid hardware with high failure rates. If a business fails to meet consumer guarantees a customer can claim compensation for losses that result, provided the loss is reasonably foreseeable and not caused by an act of god or other deity if Richard Branson isn’t available. So if a solar system fails compensation can be claimed for lost generation. Personally, under normal circumstances, I would not bother to do this. If an installer takes a week to repair a fault with a 5 kilowatt solar system then the lost output might come to $25. While I’d prefer to keep that money in my pants, I don’t see claiming compensation as being worthwhile in a situation where reasonable efforts are made to resolve an issue in a timely manner. But if the wait for repairs stretched into an unreasonable length of time then even my heroic patience may reach it limits. After all, I do have children and a horse to feed. This makes my life difficult because my children are as hungry as horses and my horse is as hungry as my children would be if they were combined into one horse like entity. The Clean Energy Council has a page on complaints and disputes here. If you are unable to get a satisfactory resolution you may need to take the issue to a consumer tribunal or small claims court. Another option is to contact your state’s Energy Ombudsman. Contact information can be found here, including for the one in Queensland. I hope she is better than Queensland’s Telecommunications Ombudsman. When my mum got onto him about her awful internet connection he turned out to be about as useful as large nuns on a bull. A great deal has been written by economists on regulatory capture and how regulators such as ombudsmen can end up representing the interests of the industry they are meant to monitor and not the interests of consumers. While they’ve come up with plenty of explanations why this occurs, personally I think they just get sick of hearing consumers complain all day and so naturally side with the people who already hate them. I have a 3kw SMA inverter that packed it in a few months out of warranty. I contacted SMA and they were willing to help if i could supply the original receipt or proof of purchase. Unfortunately i could not as i had recently purchased the house and the original owner had not given me the receipt. I contacted him and the supplier and both refused to give me a copy of the purchase receipt or even forward it to SMA. They gave the éxcuse that the receipt was commercial in confidence. SMA even contacted them but they would not give it to them either. SMA could not help me as they were required by their German company to provide the original purchase receipt. The upside is that a local installer had exactly the same inverter secondhand and installed it. It cost me around $400. 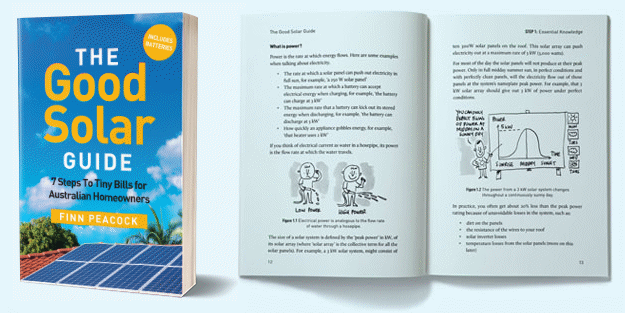 Are you on an older high feed-in tariff? If you aren’t, then I doubt the amount of electricity from a 5 kilowatt inverter would be worth $500. Particularly if it was over winter. But we don’t need to worry about the exact amount. I am definitely not a lawyer, and so this is just my non-expert understanding. This is definitely not professional advice. Regardless of just what your losses are, you could contact ABB and explain that under Australian consumer law you can claim compensation for consequential losses and ask them to compensate you. If you can’t come to a mutually satisfactory agreement and you want to pursue it further, then you could take it to a consumer tribunal or or small claims court. This will take time and effort and may come to nothing, even though my non-expert interpretation is the law is on your side, so no one can decide if it is worthwhile to pursue except you. As someone actively considering an Enphase microinverter setup (16 of them), I am curious as to what would happen if Enphase were to go under (financially) – they have great products, but appear to have an uncertain future based on their most recent SEC filing. How would ACL apply in this instance? First, the good news is that, while not perfect, Enphase microinverters are very reliable, so even if Enphase go under hopefully you would never have a problem with them. Secondly, because Enphase has managed to build a pretty good name for itself, it is possible it might be acquired as a going concern and its old warranties would be honored. I am not a lawyer and this is just my non-expert interpretation of consumer law, but let’s say Enphase goes under and one year after you bought your system one of your Enphase microinverters fails. In this case you can go to your installer and ask for a remedy. Maybe they could find you another Enphase microinverter or maybe they could offer you something else. But if they refuse to assist you, then since Australian consumer law requires them to provide you with goods of acceptable quality, which includes being reasonably durable, you could take them to a consumer tribunal or small claims court to obtains some kind of remedy. Thanks Ronald , I appreciate you taking the time to respond with some pragmatic advice. Bad Political choices in the United States ? Really? Are you SURE your not tuned into Fox News? hummmmmmmmmmmmmm.